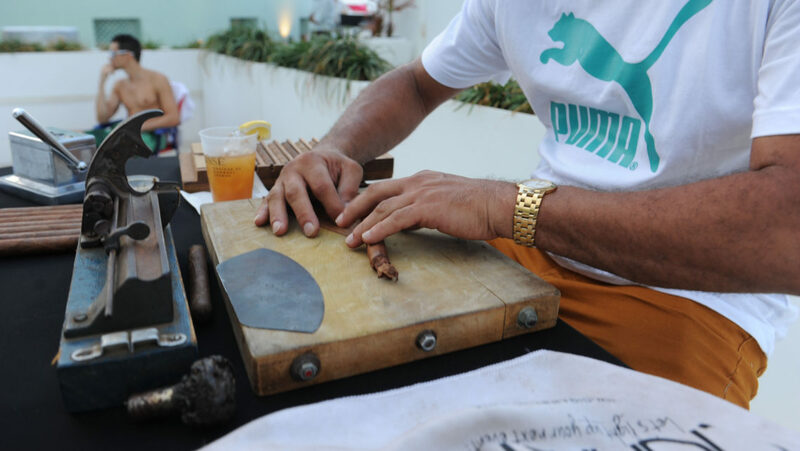 This past month, we had the opportunity to continue providing cigar rollers for corporate events by adding a little bit of flare to the PUMA Lab Powered By Footlocker at the Lincoln Road Grand Opening Celebration. This grand opening celebrated the first store of its kind in Miami. The event was in the heart of South Beach at the VIP venue Sky Deck. The 200 guests were given an exclusive look at the newly launched and highly anticipated PUMA R698 Bright Pack. The setting was a perfect backdrop for all the guests to captivate, inspire, and create a night worth remembering. The store launch was filled with PUMA themed decorations as well as PUMA themed candy and fruit bars. Guest enjoyed one of a kind 360 degree views of Miami Beach and the bustling entertainment district of Miami while dancing to live music by DJ E- Feezy and mingling with celebrity guests like NFL star Pierre Garcon. The addition of our cigar roller for the event added the extra touch to make the exclusive, invite-only guests feel they were at a one-of-a-kind launch party. ￼For the event, we had one of our cigar rollers meticulously hand-roll 50 premium cigars. cut, and light the cigars. Our host also educated the guests on the tradition and luxury of cigar rolling and how cigar rollers for events could enhance any party or celebration. The cigar roller demonstrated a genuine presentation of cigar rolling while all the guests were able to enjoy premium tobacco. The cigar roller for the event fit in perfectly and complimented all the other hip activities taking place at the launch. If you want a one-of-a kind experience, we are the best at providing cigar rollers for corporate events to entertain guests and customers with all aspects of the cigar making process. Cigar Stud has proven to be Miami’s Premier Cigar Rolling service offering its customers premium boutique cigars that are specially hand crafted live at any event. Our partnership with Cremo Cigars ensures each hand-rolled cigar is exceptionally smooth and creamy setting them apart from any other cigar you will encounter. So, don’t forget when you are planning a unique addition to your next event, having cigar rollers for events can and will make it a memorable experience.